An illustrated compendium of monsters from Acid Imp to Zombie. Well, not really. Actually I just picked three monsters to show you today. But Acid Imp and Zombie are in the game too! Meet the Trog Gouger. Trogs are pretty low level monsters that you encounter early on in the campaign. They’re nasty brutes, fond of snacking on man-flesh. In game terms, they’re fairly weak but they do come with a nasty spear attack – a melee attack with a range of two. Since most melee attacks only have a range of one, this makes it a bit difficult for your warrior to engage with them and forces you to think carefully about positioning and when you move during the round. As you can see from the figure, the Gouger also comes with some crude armor. These armor cards are reasonably effective – but have a weakness. The trogs were too cheap to buy the kind that goes all the way around, so if you can manoeuvre behind them you can bypass their armor and bump them off. The Trog Gouger is just part of the Trog family. Each family of monsters tends to have a distinctive shtick (in this case, spear attacks) but then supplements that with specialisations for the different sub-types. Yeah, it’s a Dragon, in this case the Viridian variety! What self-respecting fantasy game wouldn’t feature dragons? Dragons tend to be a lot less specialised than more lowly monsters like Trogs and they can put up a very good fight on their own. Because they aren’t minions, they get to play multiple attacks each turn and they tend to let you know about that ability. They’re some of the toughest foes you’ll face in the game. Of course, dragons can fly, which means they can move over difficult terrain and past enemies without stopping. That means it’s hard to pin them in a corner and easy for them to get behind you, negating your blocks. Dragons are also giant creatures, which means they occupy two squares on the board rather than just one. That’s generally a disadvantage for them as it makes it harder for them to manoeuvre and easier for you to get line of sight to them. But, they make up for that drawback with great armor cards, nasty ranged attacks and savage melee cards. All around, a nasty package. Viridian dragons, of course, tend to hang out in swamps, where they cultivate their poisonous breath weapon by snacking on giant poisonous frogs. They’re nasty, brutish creatures but not the top of the dragon food chain. Yes, it’s the fearsome Armored Pig! Many humanoid races keep savage animals as pets and guards. Kobolds aren’t the toughest monsters on the block, so they’ve had to settle for a war pig. They slapped a few armored plates on it to harden it up but, honestly, it doesn’t strike fear into any but the lowest level of adventurers. You’ll encounter this guy in some of the first battles of the game, where he teaches you about armor cards and how tricky they can be to play around. He’s got a rather nasty little bite card and that’s about it. “Why is he carrying a sword if he bites you?” I hear you asking. Good question. Well, that’s a small selection of monsters. 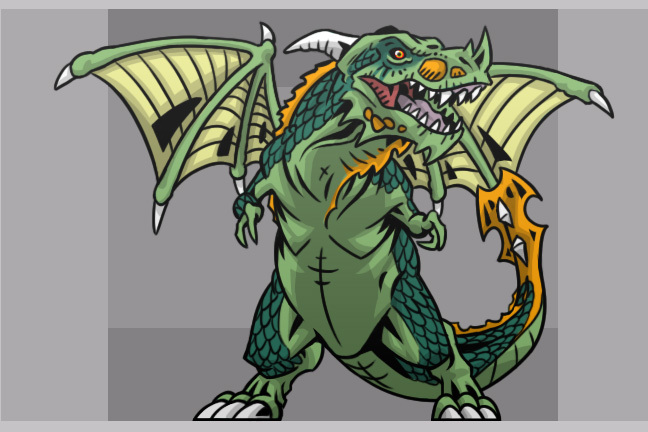 Each monster, of course, has its own pre-defined deck and that deck is 99% of what you need to know about the creature. As you play, you’ll learn what cards each monster is packing and how to design your deck to beat them. Hope you enjoyed this peek at a few of the monsters of Card Hunter! Thanks for sharing! Out of idle curiosity, what are the different areas of grey for in the frontal views? Was that for display purposes or something in the game? Those grey boxes are for ensuring the creatures are all drawn at the same size. They don’t show up when we export them to the game. Warpig? On April 1st? He has to be in the game! He’s so cute! And you should get a health bonus after defeating one because then you can snack on tasty bacon and who doesn’t get a pick-me-up from that? The pig is in the game, for real. As is bacon. Interesting choice in the war pig. Does he function as a pet/mount for whoever owns him? If so does that mean the sword is an enemy-specific item card that said enemy can wield if he gets to the pig while in battle? They would totally add a whole new dynamic to battle if this turns out to be true. You can’t ride the pig, no But that’s a great idea for a new monster! Think this looks really neat and im looking forward to play it! i guess that the sword on the piggys back, is given to you after its defeat? Well, given the presence of War Pigs, I also now expect generals, witches, black masses, and sorcerers. Actually, those all seem like reasonable things for the game to contain. The reason the pig has a sword is: Kobolds are stupid. That’s the only reason to attach a usable weapon to a creature without apposable thumbs. Hey I love the game but…..you can’t just put moth wings on a T-rex and say it can fly. Well, actually you can but you shouldn’t.